May 4, 2011: Einstein was right again. There is a space-time vortex around Earth, and its shape precisely matches the predictions of Einstein's theory of gravity. "This is an epic result," adds Clifford Will of Washington University in St. Louis. An expert in Einstein's theories, Will chairs an independent panel of the National Research Council set up by NASA in 1998 to monitor and review the results of Gravity Probe B. "One day," he predicts, "this will be written up in textbooks as one of the classic experiments in the history of physics." Time and space, according to Einstein's theories of relativity, are woven together, forming a four-dimensional fabric called "space-time." The mass of Earth dimples this fabric, much like a heavy person sitting in the middle of a trampoline. Gravity, says Einstein, is simply the motion of objects following the curvaceous lines of the dimple. Put a spinning gyroscope into orbit around the Earth, with the spin axis pointed toward some distant star as a fixed reference point. Free from external forces, the gyroscope's axis should continue pointing at the star--forever. But if space is twisted, the direction of the gyroscope's axis should drift over time. By noting this change in direction relative to the star, the twists of space-time could be measured. 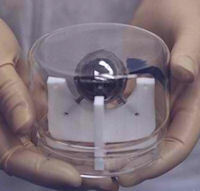 The four gyroscopes in GP-B are the most perfect spheres ever made by humans. These ping pong-sized balls of fused quartz and silicon are 1.5 inches across and never vary from a perfect sphere by more than 40 atomic layers. If the gyroscopes weren't so spherical, their spin axes would wobble even without the effects of relativity. According to calculations, the twisted space-time around Earth should cause the axes of the gyros to drift merely 0.041 arcseconds over a year. An arcsecond is 1/3600th of a degree. To measure this angle reasonably well, GP-B needed a fantastic precision of 0.0005 arcseconds. It's like measuring the thickness of a sheet of paper held edge-on 100 miles away. "GP-B researchers had to invent whole new technologies to make this possible," notes Will. They developed a "drag free" satellite that could brush against the outer layers of Earth's atmosphere without disturbing the gyros. They figured out how to keep Earth's magnetic field from penetrating the spacecraft. And they created a device to measure the spin of a gyro--without touching the gyro. More information about these technologies may be found in the Science@NASA story "A Pocket of Near-Perfection." "We measured a geodetic precession of 6.600 plus or minus 0.017 arcseconds and a frame dragging effect of 0.039 plus or minus 0.007 arcseconds," says Everitt. 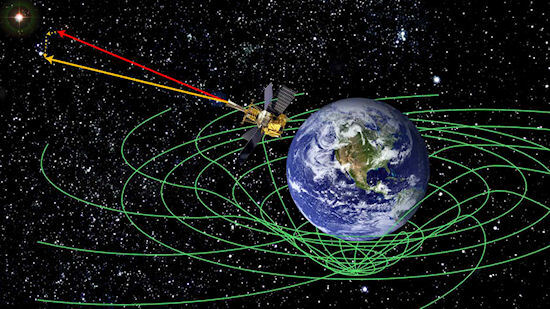 For readers who are not experts in relativity: Geodetic precession is the amount of wobble caused by the static mass of the Earth (the dimple in spacetime) and the frame dragging effect is the amount of wobble caused by the spin of the Earth (the twist in spacetime). Both values are in precise accord with Einstein's predictions. "In the opinion of the committee that I chair, this effort was truly heroic. We were just blown away," says Will. 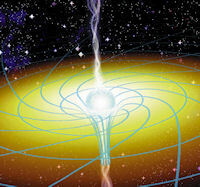 An artist's concept of twisted spacetime around a black hole. Credit: Joe Bergeron of Sky & Telescope magazine. The results of Gravity Probe B give physicists renewed confidence that the strange predictions of Einstein's theory are indeed correct, and that these predictions may be applied elsewhere. The type of spacetime vortex that exists around Earth is duplicated and magnified elsewhere in the cosmos--around massive neutron stars, black holes, and active galactic nuclei. "If you tried to spin a gyroscope in the severely twisted space-time around a black hole," says Will, "it wouldn't just gently precess by a fraction of a degree. It would wobble crazily and possibly even flip over." In binary black hole systems--that is, where one black hole orbits another black hole--the black holes themselves are spinning and thus behave like gyroscopes. Imagine a system of orbiting, spinning, wobbling, flipping black holes! That's the sort of thing general relativity predicts and which GP-B tells us can really be true. "Because it was based at a university many students were able to work on the project," says Everitt. "More than 86 PhD theses at Stanford plus 14 more at other Universities were granted to students working on GP-B. Several hundred undergraduates and 55 high-school students also participated, including astronaut Sally Ride and eventual Nobel Laureate Eric Cornell." Everitt recalls some advice given to him by his thesis advisor and Nobel Laureate Patrick M.S. Blackett: "If you can't think of what physics to do next, invent some new technology, and it will lead to new physics." "Well," says Everitt, "we invented 13 new technologies for Gravity Probe B. Who knows where they will take us?"